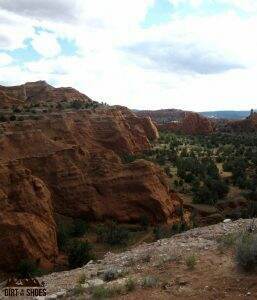 Hike the exhilarating and adventurous Angels Palace trail in Kodachrome Basin State Park! This short climb leads to a grand view of colorful cliffs, towering spires, and unique pinnacles — all while standing along the edge of a stunning butte. 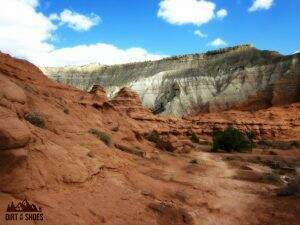 Kodachrome Basin is just a short drive from Bryce Canyon National Park and is a fun way to get away from the crowds and enjoy some great hikes. As per the name, Kodachrome Basin is a fabulous place to take pictures of vibrant red rocks against a bright blue sky. 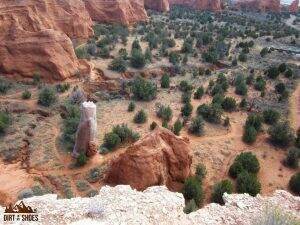 Click here for the Kodachrome Basin State Park map. From the very beginning of the Angels Palace trail, the views of the layers of colorful rock are spectacular. 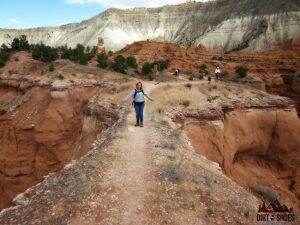 This hike starts out as a mostly flat, wide, and sandy pathway that leads into a small canyon. Upon reaching this canyon, the trail will narrow and you will begin to gain elevation as you make your way to the top of the ridge. After the short climb to the ridgeline, you are now standing on top of the butte known as the Angels Palace. From here, the trail levels out and opens up to a stunning vista in every direction. 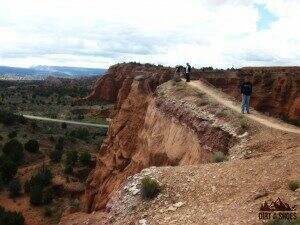 The trail at the top can be a little confusing! You will find a series of 3 small loops and one spur (side) trail that explore the nooks and crannies of Angels Palace. It’s hard to get lost in such a small area so I wouldn’t worry too much about following the trail in any particular order. Choosing your own route is part of the fun and it gives you the flexibility to make the hike as long or short as you would like. I do recommend having a map to refer to as you tour the area (just to be safe) and always be sure to stay on the trail as you explore around. My favorite stop along the route was the spur trail out to the overlook! This dramatic path leads out to the cliff’s edge and adds a HUGE element of adventure to the route. Dropping over 100 feet on both sides, this narrow stretch of the hike is not for you if you are extremely afraid of heights….looking down definitely gave me vertigo and got my heart pumping. The views (and the trail) will take your breath away! Continuing on, be sure to take some time to discover the beauty of the area as you traverse along the cliffs. From the top of Angels Palace you will enjoy phenomenal views of the basin below, the white entrada cliffs that surround you, and the unique rock formations of Kodachrome such as buttes, spires, and the mysterious sedimentary pipes. The Angels Palace hike is 1.5 miles roundtrip if you explore every inch of the trail, but it can be shorter depending on how far you feel like wandering. I would rate this trail as easy. The short 150-foot climb to get to the top of the ridge is the only elevation gained/lost along the route. From Bryce Canyon National Park, Kodachrome Basin State Park can be reached by traveling east along Highway 12 to Cannonville and then heading south along Kodachrome Road until you reach the park and entrance station (about 20 miles). A fee is required to enter Kodachrome Basin. Upon entering the state park, travel one mile north of the Visitor Center. Here you will find the Nature Trail/Angels Palace Trailhead on the left side of the road. Park here and cross the road to begin the Angels Palace Trail. 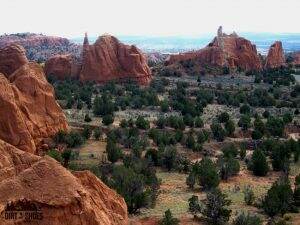 Have you been to Kodachrome Basin State Park? Do you have any questions about this hike? Let me know in the comments below!